This post is long overdue. I made dish, took the photos, and polished it off for lunch, ohhhh, about month and a half ago. I wasn’t planning on procrastinating about posting it, but spring happened. You know, those glorious few weeks in between nasty late-winter bleakness and disgusting East Coast summer humidity, when it’s actually nice to do things outdoors? When that sort of weather finally rolls around, everything else takes a back seat to being outside and working in the garden. TV doesn’t get watched. Papers don’t get graded. Blogs don’t get updated. Also, it got so warm that I almost didn’t post this dish because it seemed too unseasonal, but the relentless chilly drizzle this week has taken care of that. So, this was a creation thrown together out of laziness. It was a Sunday night, and I didn’t have anything to take for lunch on Monday. Being a teacher, this meant that I needed to pack my lunch. Because no, I just can’t bring myself to go purchase a school cafeteria meal. I kind of like having to bring a lunch to work every day since it does make it easier to be healthy, but it kind of blows when you really just wish you could go out somewhere and buy something if you don’t feel like cooking. So, back to that Sunday night. I needed to make my lunch and I really didn’t feel like going to the grocery store. 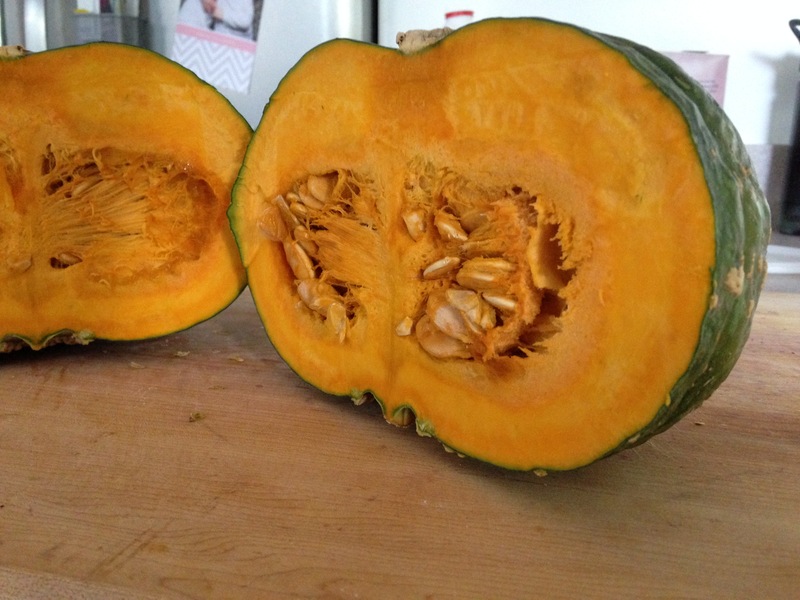 I found some raw shrimp in the freezer, had a whole kabocha squash hanging out in the pantry, and lucky me, there was a bunch of kale in the garden that I had accidentally over-wintered, and it was just waiting to be picked because it was going to seed. It was actually the same stuff I made the frittata with back in December; I never got around to pulling it out of the ground, and it just starting growing again earlier this spring. I decided to make a one-dish meal and start with a purée from the kabocha, keep the kale pretty simple with onion and garlic, and go spicy with the shrimp to balance out sweetness from the squash. For a weekday lunch, this is ideal for me. I’m pretty happy if I can make something that will last for a few days, can hang out in the fridge without getting soggy or wilty, and won’t require any more prep / chopping / assembly in the morning or during my precious 30 minutes of lunch. And I maybe get a little OCD about putting individual servings in tupperwares. And using matching tupperwares. 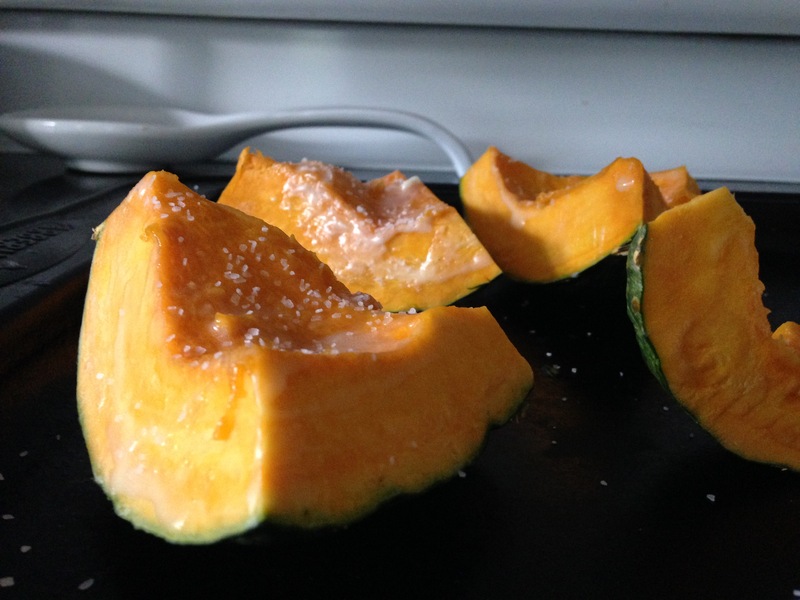 Scoop the seeds out of the kabocha, cut into pieces, brush with the melted butter, and sprinkle with kosher salt. Bake until tender, 25-30 minutes. It’s done when you can pierce it easily with a fork. Let it rest until it’s cool enough to handle, and then scoop the flesh from the shell and purée it in a food processor with the half-and-half, broth, and smoked paprika until smooth. Season to taste. Add the onion and sauté 6-7 minutes, or until starting to brown. Turn the heat down to medium and sauté for another 6-7 minutes, until completely soft. Add the garlic and cook until fragrant, another minute or so. Add the kale in handfuls, stirring between each one. Keep adding kale and stirring until it’s all wilted. Season to taste. Pat the shrimp dry. Combine the salt and all of the spices, and rub it evenly over the shrimp. Heat the olive oil in a medium pan over medium heat. Add the shrimp and sauté until just barely cooked through. 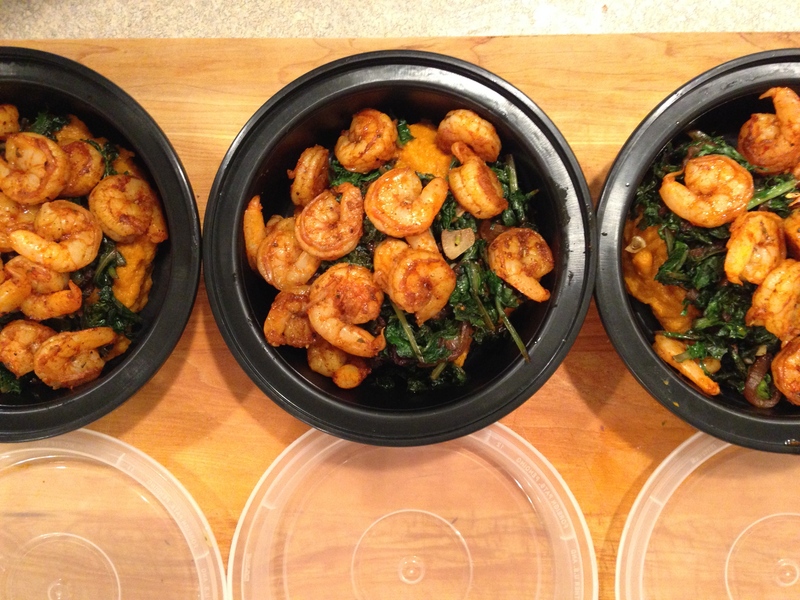 Serve the shrimp over top of the kale and the squash purée. It tastes best all mixed together.